This is one insane CBS ad: first, it attacks the Yellow Vest movement in France by having ‘white male thugs’ wear RED vests which is interesting to me since this is a communist symbol…HAHAHA…good grief. Then it shows these ‘Red Vests’ being very violent and doing exactly what we have proof, black men do during riots like Ferguson. Meanwhile, in Minnesota, a little white boy is tossed off a balcony and nearly killed by a deranged black man who was allowed to run riot previously. The left openly encourages blacks to be racist and violent. NY High School Calls Cops Over ‘White Student Union’ Instagram Page With Single Pic Of Ben Shapiro: Some very clever and daring students pulled this political prank in a mostly white school district that is right next door to the much more dangerous, much more black school districts in Rochester, New York. The authorities went nuts, are doing a ‘full police investigation’ and will severely punish the students who did this political prank thus proving the student’s right that the schools are run by crazy leftists who have no idea how the Constitution works or the dangers of giving black students the right to do this but forbidding white students the same actions. This is no joke. The ACLU actually apologized for putting up a picture of a cute little toddler holding a toy and an American flag. The SJW ANTIFA gangs and professors and Congress people went totally nuts and screamed, this is a Nazi picture and no white child should appear on any ACLU site…ever again. See? They are insane and extremely racist, too. And shame on the ACLU bowing down to fascists so quickly. Shame on them all! And they are lawyers, too! I knew Ted Turner many years ago. He was my lifeline to the news because he didn’t ‘white’ me out like the Fake News and let me even have a news crew at my own discretion. Then he wanted money for various projects, I warned him about this, he sold stock, had a board of directors who were the same people who control Fake News and then they took it over, he left the country and CNN became the stupidest news propaganda site on earth. Today, I often go to the London Daily Mail because they are charming, printing all sorts of stories all over the map and is a fun place to track things here in Occupied Territory of the USA. The US has this long tradition since WWII of celebrating football. As we finally drag ourselves into yet another Super Bowl, the destruction of the players is studiously ignored by the media giants and our rulers because both love this sport since it is quite violent, destructive and above all, is mainly destroying black males, not ruling elite groups. This is so very much like the Roman Empire! Lots of money is made betting on these gladiatorial games. Black males in particular, dream of making it big, getting rich, playing this game but head injuries (aside from the many other injuries) and the long retirement period usually destroys their lives which saddens me. They are loved when playing the game and despised when on the streets, afterwards. Look at the Daily News story here. A murderer with a gun is running loose in NYC and there is zero descriptions of what this clown looks like or speculation about his identity. He is, by default, a black male as is the victim who is also not described. Smart readers look at the address of the killing and presume he is black, too. Nearly all the murderers and most but not all the victims are black, too. 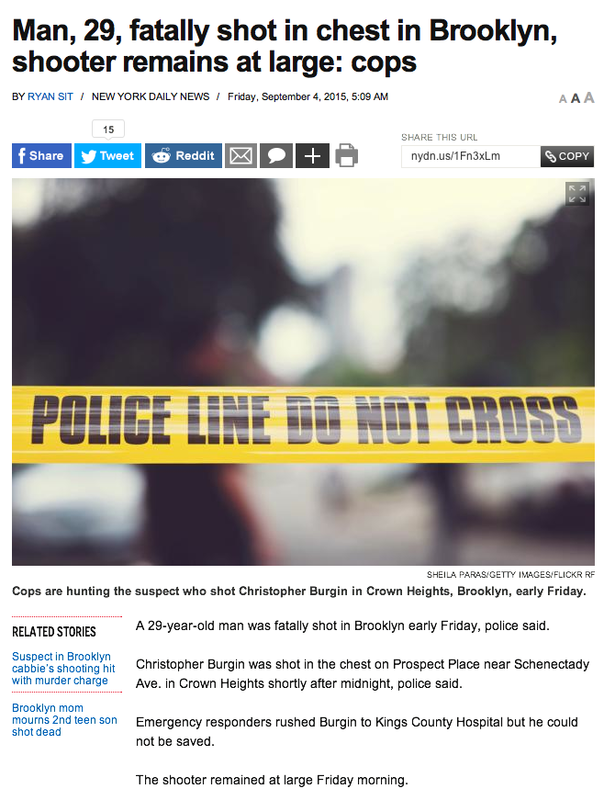 A cabbie was shot and he was Asian while the shooter was black and luckily for us, the cabbie had a camera that took pictures so everyone knows the shooter is black but the story for that murder in the Daily News makes no mention of the fact that the killer was a black male. Under Bloomberg, black males were disarmed and they complained loudly about racism as they were randomly searched. Hundreds of black males lived for another four years thanks to Bloomberg but they are making up for lost opportunity to gun down each other by going crazy with guns under the Democratic mayor who is married to a black woman and has a young adult black son who has body guards so he is still alive.